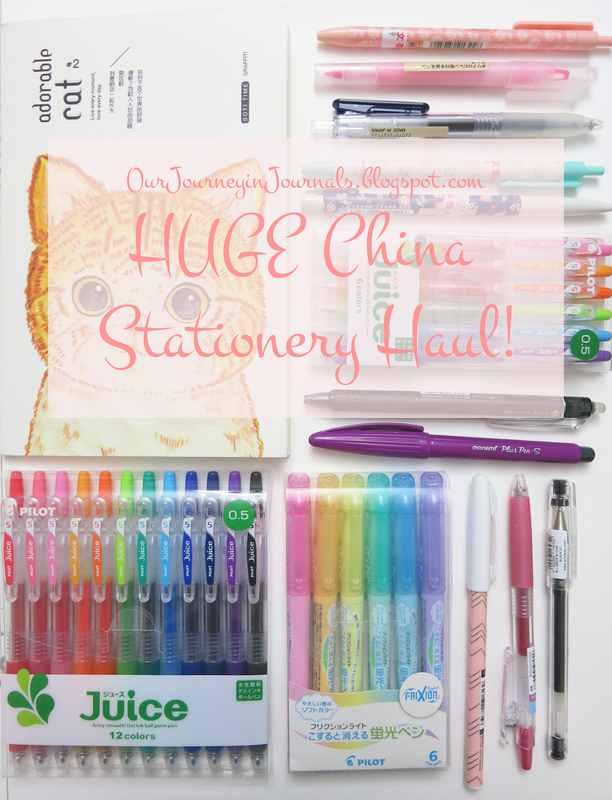 Our Journey in Journals: HUGE China Stationery Haul! Ok, I have a bit of a problem with stationery hauls. Well, the problem is that only in the past several months, this is the third haul I've had! I think I'm just making up for all of the years in my life that I missed out on awesome stationery. But seriously, I couldn't pass up buying stuff in the world's favorite continent for cute stationery - Asia (and more specifically, China). As some of you may know, I went to China for about three weeks in July. 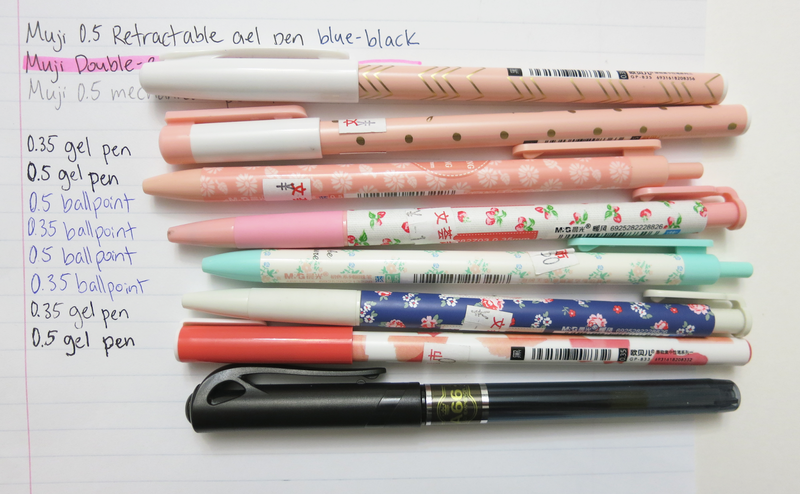 While I was there, I got an almost obscene amount of stationery, mostly awesome pens. This post will detail all of the stuff I got, so without further ado, here is my China stationery haul! First, let's start out with gel pens. 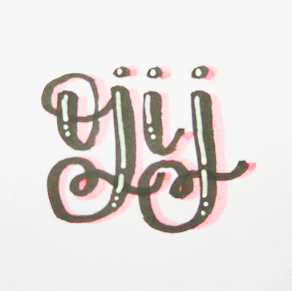 Back in June, I bought a couple of Pilot Juices from Tokyo Pen Shop, and I absolutely adore them; they're currently my favorite gel pens. Thus, I decided to get more of the colors that are available in 0.5. Originally, Andie ordered a 6-pack from Taobao, and then when I arrived, I found a 24-pack for sale. The 6-pack has baby pink, apricot orange, orange, apple green, light blue, and grape. 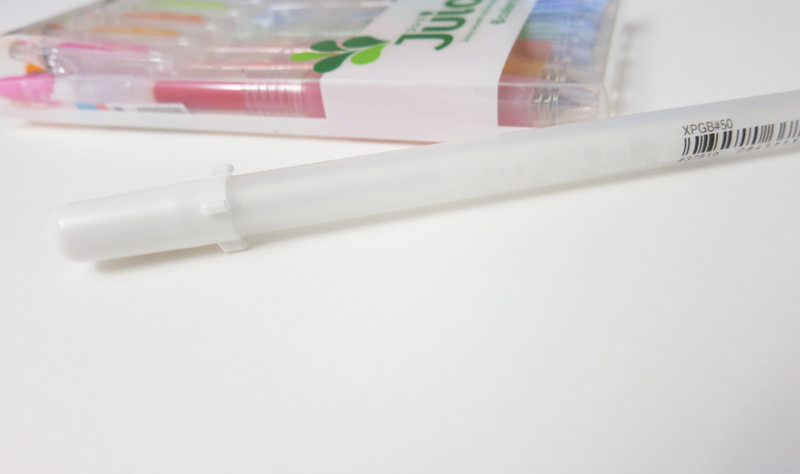 Something I really like about the Pilot Juice gel pens is that they include the name both in Japanese and English. 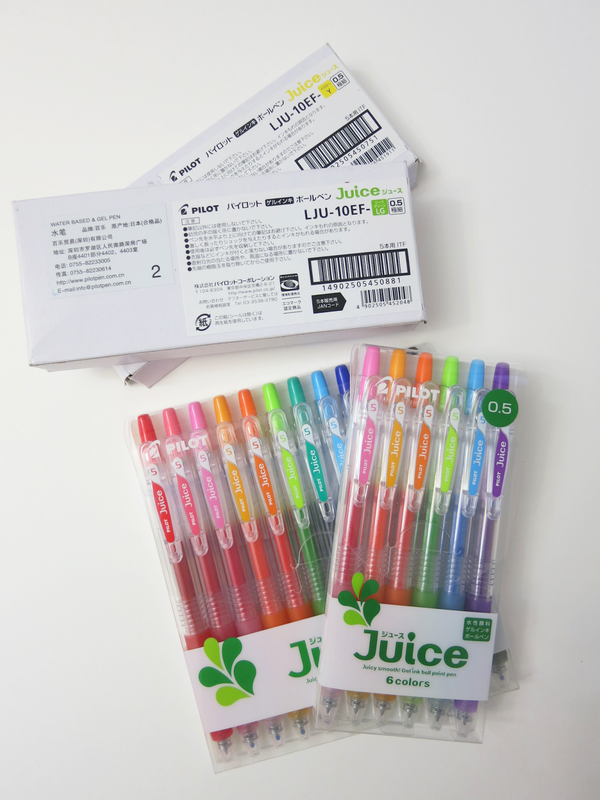 Anyway, the set of 24 includes all of the colors in the Juice range except for the pastels and metallics, and it arrived as a packaged set of 12 and two cartons with six pens each. The cartons were kind of abused in my suitcase, so they look a little destroyed now. Andie also purchased the white Sakura Classic Gelly Roll for me from the Internet (I'm assuming Taobao). It's really good for highlights, though I still haven't used it very much yet. 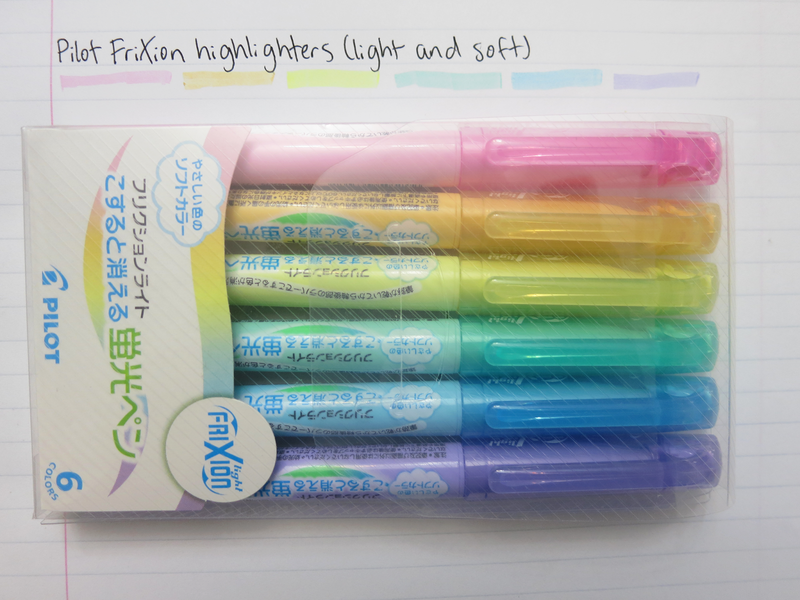 Also from Taobao, we got two packs of highlighters: a set of Uni Propus Window Highlighters and a pack of Pilot FriXion Light and Soft Highlighters. The former comes with five fluorescent, double-ended highlighters (a chisel tip and a bullet tip), and the latter includes six pastel, erasable highlighgers. 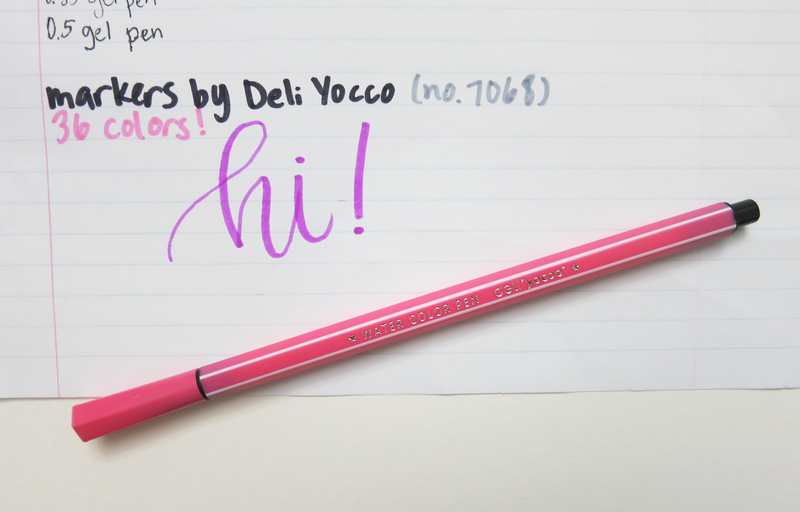 The Uni Propus ones also have a clear window in the chisel tip so you can see what you're highlighting, hence the name. Along with all of these pens, Andie bought some correction (per my request) She only purchased two things of tape, but the store sent several more as a free gift. 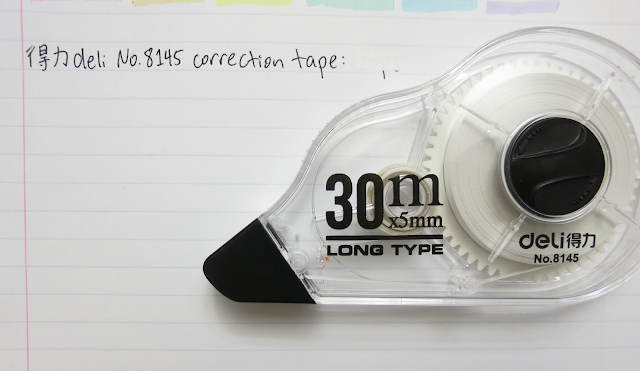 They're by the brand 得力 (Deli), and the tape itself is 5 mm tall and 30 m long (I think). That purchase was definitely worth it. During my visit in 南京 (Nanjing, the former capital of China), my family stayed in the Golden Eagle Summit Hotel, which is really, really fancy shmancy. It's one of those hotels that has a mall underneath it, and the mall had a Muji! I was really excited since it was my first time going to a Muji store. I got a blue-black retractable gel pen and a double-ended pink highlighter. 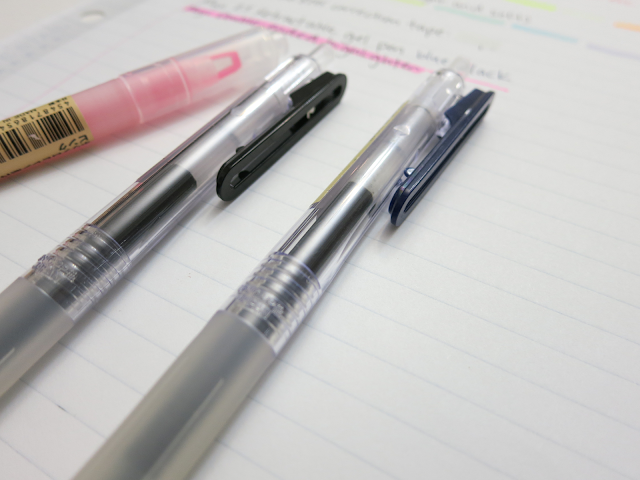 The gel pen is really similar to the Zebra Sarasa Push Clip Gel Pen in that it has a binder clip. 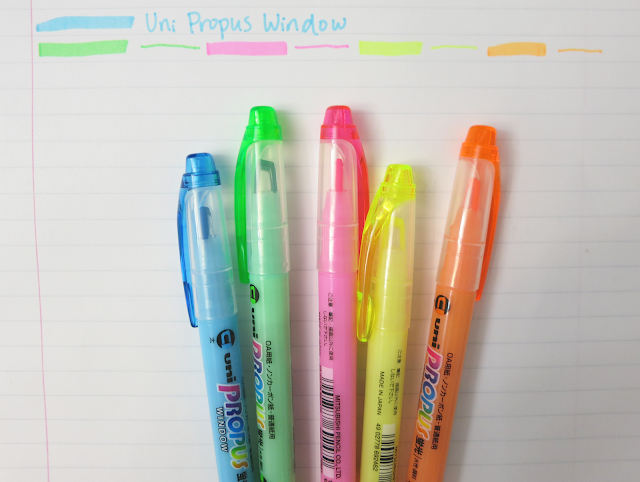 The Muji highlighter is pretty much exactly the same as the Uni Propus Window; the pink is even almost the same exact shade as the Uni Propus pink highlighter. Regardless of the unoriginality of the two products, they are still high quality. 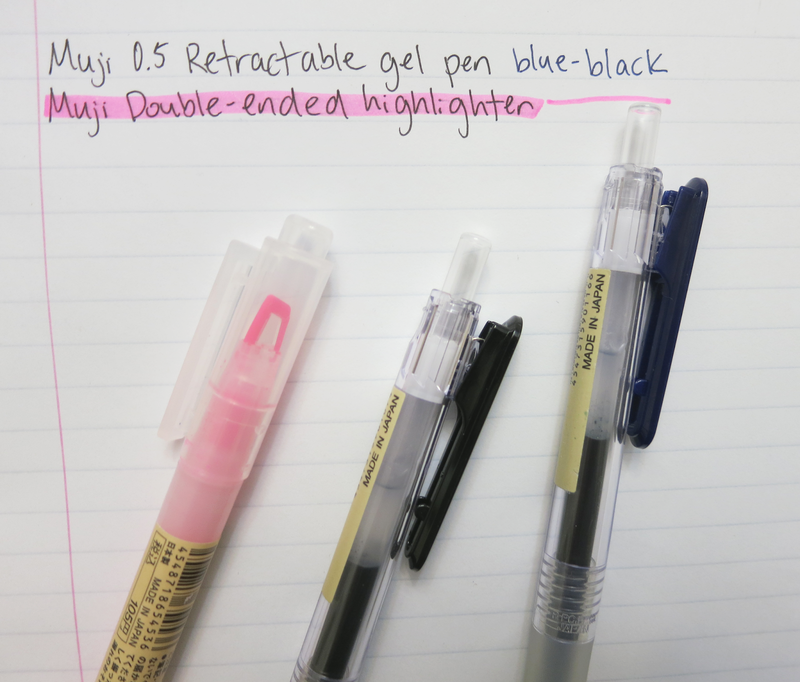 From online, Andie got me two Muji lined notebooks (one in B5 and the other in A5), the same retractable gel pen as above but with black ink, and a 0.5 mechanical pencil - which I believe is the rubber grip polycarbonate mechanical pencil. While we were staying in 会昌 (Huichang, my mom's and Andie's hometown), Andie brought me to two physical stationery shops. Well, they sold stationery among other things. 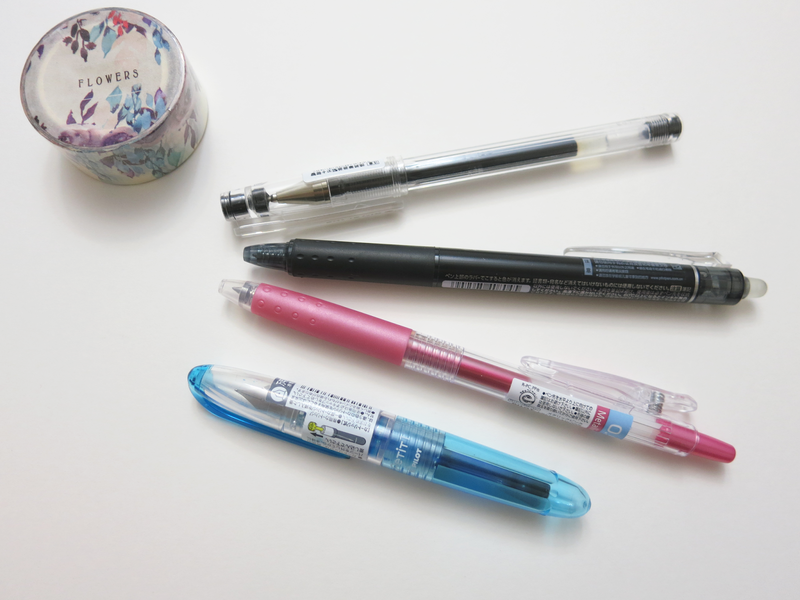 But anyway, the first had a bunch of cheap pens, so I got a mixture of ballpoints and gel rollerballs from there. If you have any specific questions about any of the pens pictured below, just make sure to leave me a comment below. Before I arrived in China, Andie had gone to this same shop and got this set of 36 markers by the brand Deli Yocoo (the same brand as the correction tapes). From what I understand, they're very similar to the Stabilo Pen 68 markers. The second was actually a makeup store, but they also had a pretty nice stationery section, too. 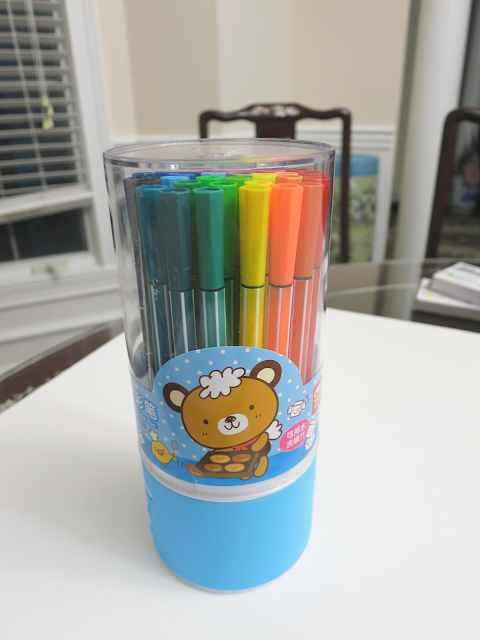 From there, I got three pens and a 12-pack of washi by the Korean brand Ximiso. 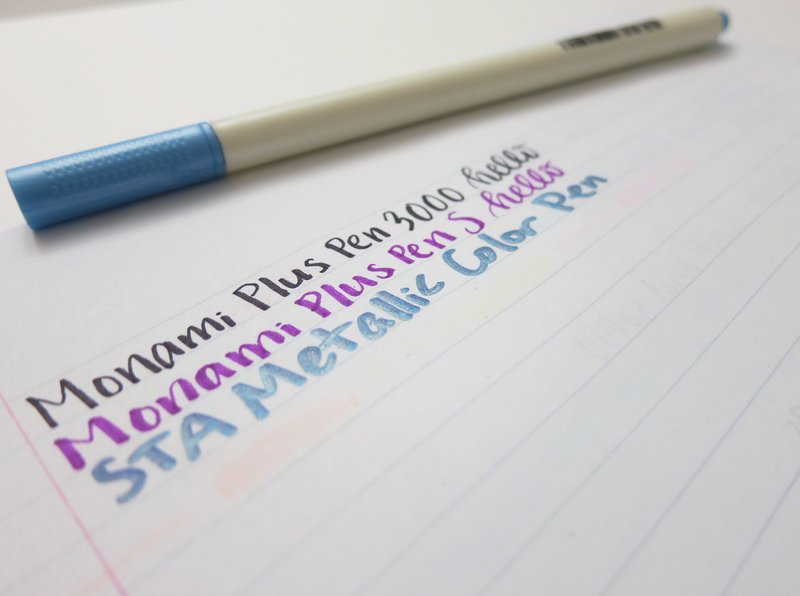 Two of the pens were brush markers - the Monami Plus Pen 3000 in black and the Monami Plus Pen S in purple. They both have really hard tips, so you can get lines almost literally the width of a hair if you try hard enough. The third pen I got is the STA Metallic Color Pen, which is a super shiny metallic blue marker. The set of 12 washi rolls was a really nice price; it only cost ¥10, or about $1.50 USD. Speaking of washi tape, I purchased another roll in addition to the one mentioned above. Andie also purchased a couple of rolls that are still with her. The one I bought is from a bookstore in a 赣州 (Ganzhou) mall called 西西弗书店 (Sisyphe Bookstore). It's a really pretty blue and purple floral print, and it says "flowers" on the the packaging. I also got a couple of pens and journals from Sisype Bookstore. 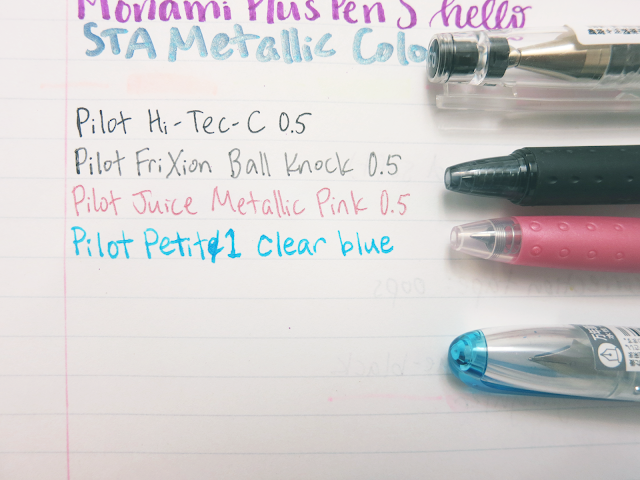 As for the pens, I purchased the Pilot Petit1 in clear blue, a black Pilot FriXion Ball Knock in 0.5 (erasable gel pen), a black Pilot Hi-Tec-C in 0.5 (gel pen), and a 0.5 Pilot Juice in metallic pink, which is a very good metallic gel pen. The Petit1 is a mini fountain pen, and it's my first fountain pen ever! When I was still at the mall, I accidentally dropped it on the floor, and I was so scared that I had broken it (but fortunately, it is still alive and well). I got two journals from the bookstore. 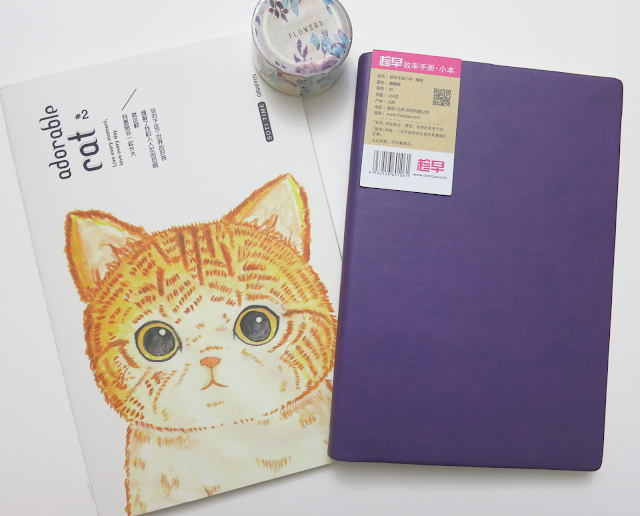 The first is a purple B6 lined notebook from the brand 趁早 (Chen Zao, "as early as possible" - it didn't have an English name). 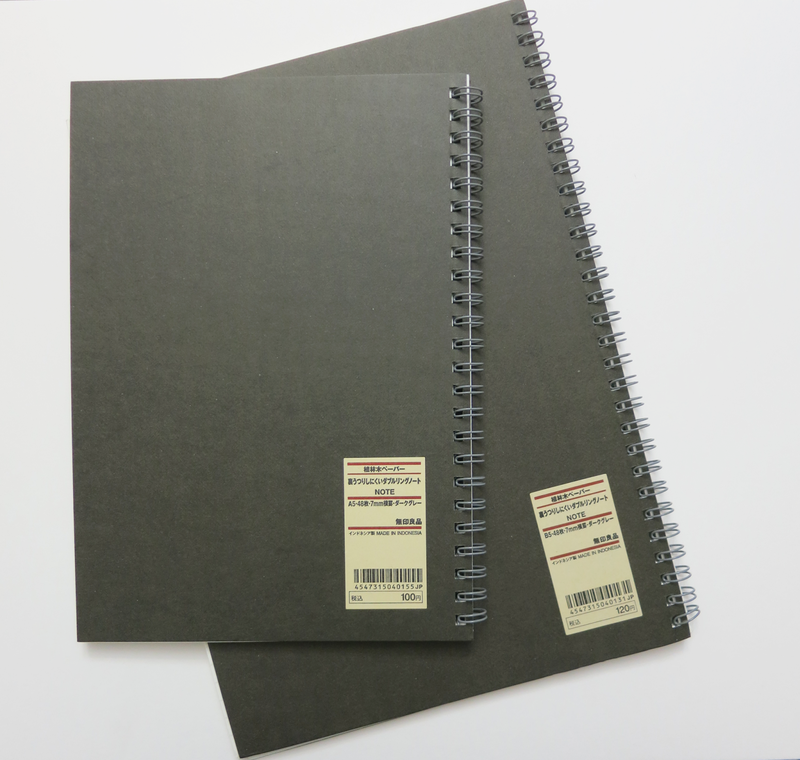 It has yellow accents, and the softcover is made of an Italian leatherette-type of material.The other notebook I got, which also has lined paper, is about B6-sized by the brand Soti Time. It has a drawing of a cat, and it says "adorable cat #2" on the front cover. I'm planning on giving this one as a gift to my older sister. Wow, that was a lot of stuff - not that I'm complaining, of couse! 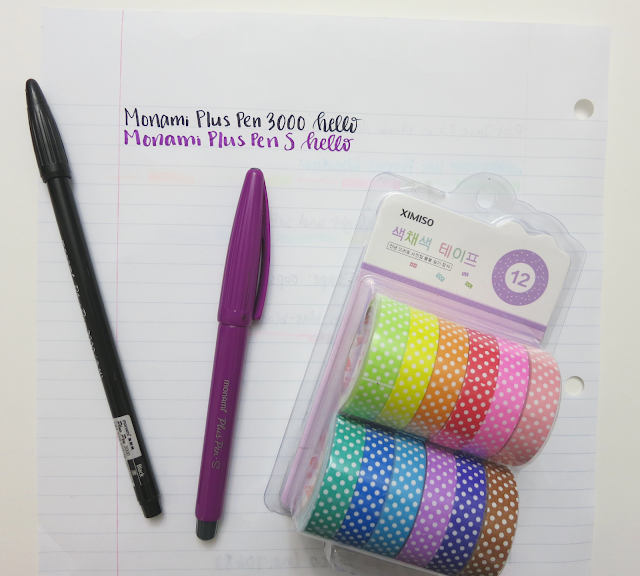 I'm really looking forward to using all of these things, both in the new school year (which started this past Tuesday) and in my bullet journal. They will certainly lessen my suffering in school. Comment down below what stationery you've gotten from overseas before! That's cool! I'm going to New York in a couple of months, so I want to get more pens from Muji.